(Host) Vermont Gas Systems wants to extend its natural gas pipeline another 50 miles south to begin serving customers in Vergennes and Middlebury. In a series of informational meetings, the company tells Addison County residents that the $57 million project has environmental and economic benefits. But as VPR’s Melody Bodette reports, some people are still raising concerns. (Bodette) Vermont Gas currently pipes natural gas across Canada from Alberta. A pipeline comes south and enters the U.S. in Highgate, serving 45,000 customers in Franklin and Chittenden counties. Communications Director Steve Wark says propane and heating oil could be replaced if the system were expanded south to the larger communities in Addison County. (Wark) "This is a big project, a big project for Vermont Gas, we think it’s a big project for Vermont. Fundamentally we see this as a greater good project." (Bodette) Vermont Gas says new technology allows more gas to be extracted, which drives down prices. So the company says natural gas will become a bigger part of Vermont’s energy mix. The company says the benefit is that natural gas emits less greenhouse gases when it’s burned than other heating fuel sources. At a meeting in Middlebury, Vermont Gas President Don Gilbert says the recent addition of 450 customers in Jericho shows that the project will have economic benefits as well. (Gilbert) "In Jericho we were able to save those customers over $650,000 a year and those were almost all residential customers. We’re very much interested in serving residential but it’s the combination of commercial, industrial and residential that will really support this project. (Bodette) The pipeline would head southward from Hinesburg to Monkton, and serve the town of New Haven before heading to Vergennes and Middlebury. Middlebury Town Planner Fred Dunnington says there’s been a lot of interest in the project from businesses and homeowners. (Dunnington) "There’s a lot for the town to do to gear up for this. At the same time, we recognize that people are going to be clamoring for this. When we’re talking practically half the price of propane, this is serious money to people." (Bodette) But Addison County residents such as Alice Eckles of Middlebury voiced concerns about how natural gas is produced. She notes that the process of hydro-fracking is controversial – and isn’t allowed in Vermont. (Alice Eckles) "If we’re having a moratorium on fracking here, it means there’s significant concerns about it. And if we don’t feel comfortable with fracking, why should we be allowing it to come through. That seems hypocritical." (Bodette) Don Gilbert says extraction can be done in a way that isn’t harmful to the environment. Gilbert says the company hopes to eventually extend the pipeline south to Rutland, and into New York to tie into the U.S. natural gas system. (Gilbert) "In the long run I think it will be very important to the state. Having another source, being able to take advantage of more local supply of natural gas, being able to have options on how we obtain our gas." (Bodette) Vermont Gas says it will apply for state permission to build the pipeline by the end of the year. If it’s approved, customers could be connected in 2015. For VPR News, I’m Melody Bodette. (Host) One more public meeting will be held on the project on Wednesday night at 7 p.m. at the New Haven Town Hall. 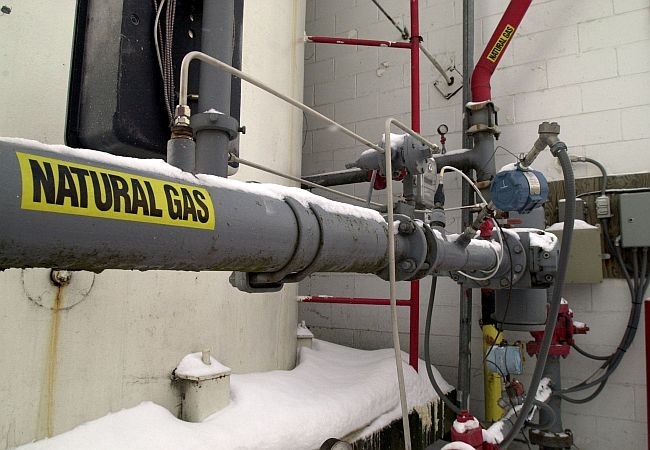 Vermont Gas Systems is inching forward with its plan to expand natural gas service to Addison County and points south, with the support of town officials.